Sorry but tickets are no longer available. Please select another show time or call the Box Office at 615.269.0221. Earthquake: The life and times of Comedian Earthquake reads like an unlikely happenstance that has fallen into divine rightness. Everyone knows the story, he didn’t have an epiphany about his career, but what everyone is missing, is that somehow someway he is standing right where he needs to be. Washington D.C.’s own Nathaniel Stroman turned Earthquake has a knack for gut instinct. It’s how he came to have thousands of adoring fans and has graced every media opportunity afforded a stand-­‐ up comedian in this day and age. ‘The way I approach my show is unique’, Earthquake says.’ I don’t have a plan, I just step on stage and it goes from there’. And there it goes, is right. From the late 1990’s to the turn of the millennium he had the nation laughing to tears in repeat mode saying, ‘I wanna put my air in my mama’s name’. He then changed with the times and said ‘You still like cheese in your eggs O.J.? ?’ Nevertheless, he got the clue that the world was listening and while that never determined his direction, it was rewarding to know he had an impact. That impact lead him to iconic performances on BET’sComic View making his performance cultural staple of urban media lifestyle. 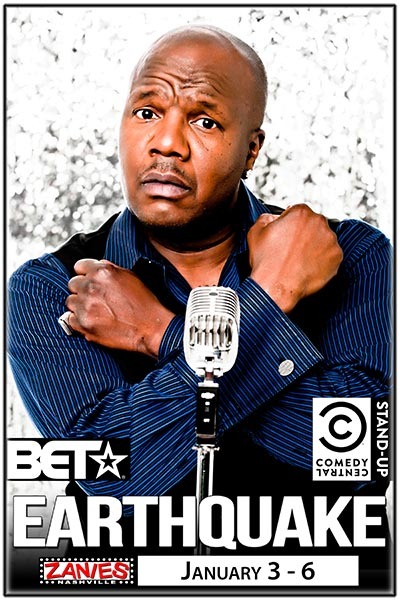 He then blessed the stages at HBO’s Def Comedy Jam, shot a couple of 30-­‐minute specials on Comedy Central and BET respectively and gave a critical acclaimed performance on his solo effort One Night Stand for HBO. He shook up audiences at the Walter Latham Presents taping making it what some say was his best performance to date and consistently obliged the audiences in Jamie Foxx’s Laffapalooza and 2009’s Shaq’s Comedy All-­‐stars. He blessed the TBS Comedy Fest in Rat Pack attire and was subsequently labeled by critics as the possible (yet respectful and honorable) predecessor to the late great Bernie Mac. A unique voice, uncommon appeal and with a sense and sensibility that will make the brilliant feel dumb, Quake (as he is known by fans) rose above the laws of the land and continued to shake up audiences all over the world. His break out performance film ‘About Got Damm Time’, became an instant popular collectible and his ‘From the Outhouse to the Penthouse’ shocked the masses as he proudly captivated audiences live the weekend of the first inauguration of President Barack Obama. His subsequent film appearances in Getting Played with Vivica Fox, Barnyard and animated classic, Clerks IIwith Wanda Sykes and Ice Cube’s The Longshot’s gave Quake fans a taste of a promising future. The remainder of his resume reads like a who’s who of stand-­‐up comedy while he traveled the mainstream circuit blessing the forums of HBO’s Bill Maher(which made him the first comedian to receive a standing ovation on that show) Howard Stern (with Stern calling him his new favorite comedian), and Chelsea Lately to name a few. His most interesting looks were caught on trendy talk shows likeWeekend At D.L.’s and Baisden After Dark, but when the nation caught him gliding on the stage at George Lopez, it was as if time had stood still. Refreshingly charming with a pristine presentation Quake looks amazing as if he hadn’t been in the game for 20 years. His fans were excited to receive him as the unforgettable Uncle Mike in Chris Rock’s beloved Everybody Hates Chris a recurring role he had the world on board with his infectious…’Big man!’. If Quake has learned nothing else about himself he has learned that what he says impacts language. Presently Comedian Earthquake is basking in the love he received from comedic icon Whoopi Goldberg as one of her favorite comedians. In April of 2013, he appeared on ABC’s The View in a special segment of stand-­‐up comedians showcased by the cast of The View as their personal favorites. Whoopi Goldberg chose Earthquake and in front of all of America she relished in his ‘fearlessness’. Needless to say, he shined to rave reviews. He then made an appearance on the popular late night program TBS’s Conan O’Brien and taped an eagerly anticipated forthcoming episode of BET’s hit sitcom ‘The Game’. It doesn’t look like his ‘natural’ is a disaster after all.